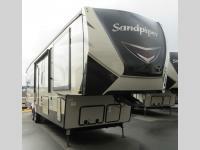 Space, luxury, and high-class furnishings are what you will find in this Sandpiper fifth wheel! 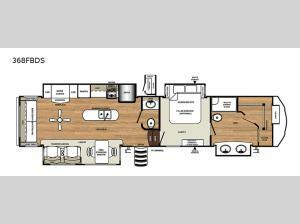 With its four slides, the interior feels open and inviting no matter where you are inside, and with the exceptional features included in the master suite, you have everything you need to escape the mundane travel experiences of times past, like a huge wardrobe and your own large bathroom with a dual-sink vanity. You will also be impressed by the fabulous living area because it contains its own half bath so that your guests feel comfortable when they visit, a cozy fireplace for cooler evenings, and theater seating with heat and massage.